Electrical grids can be prone to malicious intrusion or attack; thus, there is a need for electric grid security. Also as electric grids modernize and introduce computers, cyber threats also start to become a security risk. Early electric energy was produced near the device or service requiring that energy. In the 1880s, electricity competed with steam, hydraulics, and especially coal gas. Coal gas was first produced on customer's premises but later evolved into gasification plants that enjoyed economies of scale. In the industrialized world, cities had networks of piped gas, used for lighting. But gas lamps produced poor light, wasted heat, made rooms hot and smoky, and gave off hydrogen and carbon monoxide. They also posed a fire hazard. In the 1880s electric lighting soon became advantageous compared to gas lighting. Network diagram of a high voltage transmission system, showing the interconnection between the different voltage levels. This diagram depicts the electrical structure  of the network, rather than its physical geography. The demand, or load on an electrical grid is the total electrical power being removed by the users of the grid. Baseload is the minimum load on the grid over any given period, peak demand is the maximum load. Historically, baseload was commonly met by equipment that was cheap to run, that ran continuously for weeks or months at a time, but globally this is becoming less common. The peak demand requirements are sometimes produced by peaking plants that are generators optimised to come on-line quickly. The sum of the power outputs of generators on the grid is the production of the grid, typically measured in gigawatts (GW). The total energy produced is the integral of the power outputs, which is measured in gigawatt hours (GWh). It might be expected that demand and production might be equal, however, in practice power is lost in transmission lines and transformers in the transmission grid. The sum of the maximum power outputs (nameplate capacity) of the generators attached to an electrical grid might be considered to be the capacity of the grid. However, in practice, they are never run flat out simultaneously. Typically, some generators are kept running at lower output powers (spinning reserve) to deal with failures as well as variation in demand. In addition generators can be off-line for maintenance or other reasons, such as availability of energy inputs (fuel, water, wind, sun etc.) or pollution constraints. Firm capacity is the maximum power output on a grid that is immediately available over a given time period, and is a far more useful figure. Electricity Interconnection Level (EIL) of a grid is the ratio of the total interconnector power to the grid divided by the installed production capacity of the grid. Within the EU, it has set a target of national grids reaching 10% by 2020, and 15% by 2030. A brownout is an intentional or unintentional drop in voltage in an electrical power supply system. Intentional brownouts are used for load reduction in an emergency. The reduction lasts for minutes or hours, as opposed to short-term voltage sag (or dip). The term brownout comes from the dimming experienced by incandescent lighting when the voltage sags. A voltage reduction may be an effect of disruption of an electrical grid, or may occasionally be imposed in an effort to reduce load and prevent a power outage, known as a blackout. A black start is the process of restoring an electric power station or a part of an electric grid to operation without relying on the external electric power transmission network to recover from a total or partial shutdown. Normally, the electric power used within the plant is provided from the station's own generators. If all of the plant's main generators are shut down, station service power is provided by drawing power from the grid through the plant's transmission line. However, during a wide-area outage, off-site power from the grid is not available. 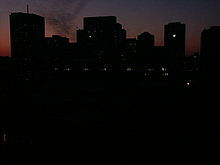 In the absence of grid power, a so-called black start needs to be performed to bootstrap the power grid into operation. To provide a black start, some power stations have small diesel generators, normally called the black start diesel generator (BSDG), which can be used to start larger generators (of several megawatts capacity), which in turn can be used to start the main power station generators. Generating plants using steam turbines require station service power of up to 10% of their capacity for boiler feedwater pumps, boiler forced-draft combustion air blowers, and for fuel preparation. It is uneconomical to provide such a large standby capacity at each station, so black-start power must be provided over designated tie lines from another station. Often hydroelectric power plants are designated as the black-start sources to restore network interconnections. A hydroelectric station needs very little initial power to start (just enough to open the intake gates and provide excitation current to the generator field coils), and can put a large block of power on line very quickly to allow start-up of fossil-fuel or nuclear stations. Certain types of combustion turbine can be configured for black start, providing another option in places without suitable hydroelectric plants. In 2017 a utility in Southern California has successfully demonstrated the use of a battery energy storage system to provide a black start, firing up a combined cycle gas turbine from an idle state. As the 21st century progresses, the electric utility industry seeks to take advantage of novel approaches to meet growing energy demand. Utilities are under pressure to evolve their classic topologies to accommodate distributed generation. As generation becomes more common from rooftop solar and wind generators, the differences between distribution and transmission grids will continue to blur. In July 2017 the CEO of Mercedes-Benz said that the energy industry needs to work better with companies from other industries to form a "total ecosystem", to integrate central and distributed energy resources (DER) to give customers what they want. The electrical grid was originally constructed so that electricity would flow from power providers to consumers. However, with the introduction of DER, power needs to flow both ways on the electric grid, because customers may have power sources such as solar panels. Due to the enormous capital outlays, utilities were a vertically integrated business throughout the 20th century owning the power generation, the (transmission) lines while also managing the bills (commercialization). Nowadays technological progress has enabled individuals and groups to take on the functions that used to be the sole domain of the utility. Adding to the shift is the impact of aging infrastructure on reliability, security and performance factors. ^ Overland, Indra (2016-04-01). "Energy: The missing link in globalization". "Energy Research & Social Science". 14: 122–130. doi:10.1016/j.erss.2016.01.009. Archived from the original on 2018-02-05. ^ Douris, Constance. "As Cyber Threats To The Electric Grid Rise, Utilities And Regulators Seek Solutions". Forbes. Retrieved 2018-09-27. ^ Mr Alan Shaw (29 September 2005). "Kelvin to Weir, and on to GB SYS 2005" (PDF). Royal Society of Edinburgh. Archived (PDF) from the original on 4 March 2009. ^ "Lighting by electricity". The National Trust. Archived from the original on 2011-06-29. ^ Cuffe, Paul; Keane, Andrew (2017). "Visualizing the Electrical Structure of Power Systems". IEEE Systems Journal. 11 (3): 1810–1821. doi:10.1109/JSYST.2015.2427994. ISSN 1932-8184. ^ Abdelhay A. Sallam & Om P. Malik (May 2011). Electric Distribution Systems. IEEE Computer Society Press. p. 21. ISBN 9780470276822. ^ Mezősi, András; Pató, Zsuzsanna; Szabó, László (2016). "Assessment of the EU 10% interconnection target in the context of CO2 mitigation†". Climate Policy. 16 (5): 658–672. doi:10.1080/14693062.2016.1160864. ^ "California battery's black start capability hailed as 'major accomplishment in the energy industry'". ^ "EEX Market Monitor Q3/2008" (PDF). Leipzig: Market Surveillance (HÜSt) group of the European Energy Exchange. 2008-10-30: 4. Retrieved 2008-12-06. ^ "Serbia, Kosovo power grid row delays European clocks". Reuters. Mar 7, 2018. ^ Saleh, Mahmoud; Esa, Yusef; Mhandi, Yassine; Brandauer, Werner; Mohamed, Ahmed (2016). "Design and implementation of CCNY DC microgrid testbed". Design and implementation of CCNY DC microgrid testbed - IEEE Conference Publication. pp. 1–7. doi:10.1109/IAS.2016.7731870. ISBN 978-1-4799-8397-1. ^ Saleh, Mahmoud; Esa, Yusef; Mohamed, Ahmed (2018). "Communication Based Control for DC Microgrids - IEEE Journals & Magazine". IEEE Transactions on Smart Grid: 1. doi:10.1109/TSG.2018.2791361. Retrieved 2018-06-16. ^ "Industry Cross-Section Develops Action Plans at PJM Demand Response Symposium". Reuters. 2008-08-13. Archived from the original on 2009-02-19. Retrieved 2008-11-22. Demand response can be achieved at the wholesale level with major energy users such as industrial plants curtailing power use and receiving payment for participating. ^ a b "Nearly three quarters of US took steps toward grid modernization in first quarter, study finds". Daily Energy Insider. 2017-05-25. Archived from the original on 2018-05-08. Retrieved 2017-06-05. ^ "Five ways to modernize the U.S. electric power grid via Advanced Energy Economy | Solar Builder". Solar Builder Magazine. 2018-08-06. Retrieved 2018-08-30. ^ Randolph, Kevin (2017-07-21). "In order to integrate the grid, disparate industries need to work together". Daily Energy Insider. Retrieved 2017-08-03. ^ Smart Grid - The New and Improved Power Grid: A Survey; IEEE Communications Surveys and Tutorials 2011; X. Fang, S. Misra, G. Xue, and D. Yang; doi:10.1109/SURV.2011.101911.00087. ^ Alexandra Von Meier (2013). Electrical Engineer 137A: Electric Power Systems. Lecture 2:Introduction to Electric Power Systems, Slide 33. ^ Nunez, Christina (December 14, 2012). "Who’s Watching? Privacy Concerns Persist as Smart Meters Roll Out Archived 2018-03-16 at the Wayback Machine". National Geographic. nationalgeographic.com. Retrieved 2018-03-16. ^ "U.S. Energy Independence and Security Act of 2007". Archived from the original on 2015-12-19. Retrieved 2007-12-23. ^ The Economics of Grid Defection - Rocky Mountain Institute "The Economics of Grid Defection". Archived from the original on 2016-08-12. Retrieved 2016-08-13. ^ "Grid defection and why we don't want it". 2015-06-16. ^ Aging And Unstable, The Nation's Electrical Grid Is 'The Weakest Link'.